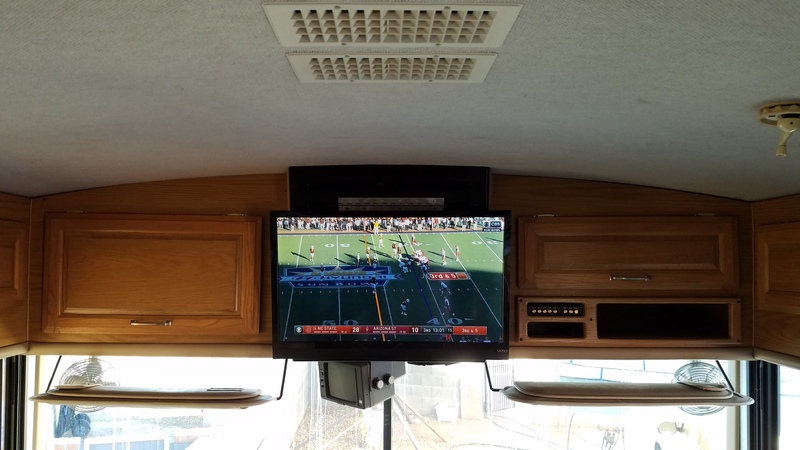 my new years higher resolution… – RV Cheaper! December 29, 2017 March 21, 2018 RV Cheaper! I had an extra flat screen we weren’t using so I decided to ditch that old dinosaur glass TV and Digital TV converter I had to use with it. Switching to a flat screen also opens up a bunch of storage space even though it was only a 15′ TV. I had to burn a few brain cells to come up with how I wanted to mount it. I bought a swing-up ceiling mount to let me swing the TV up for access to the new storage bin where the old TV sat. The swing-up mount posed all kinds of problems so I returned it. 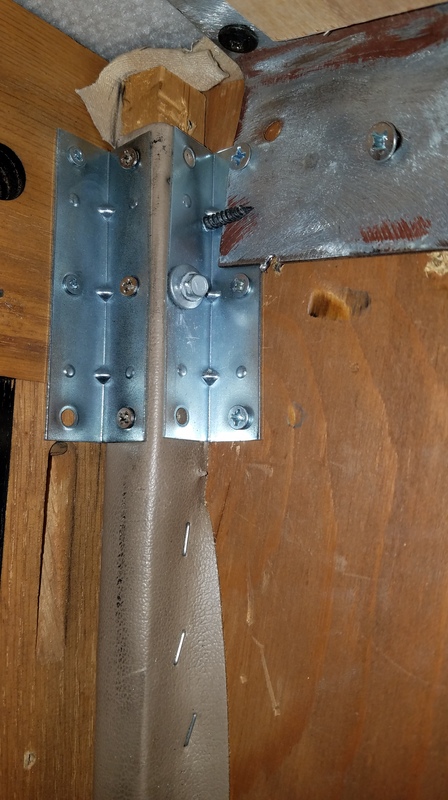 As usual I had to go back to the drawing board and finally came up with a swing up door idea that used a much simpler and cheaper bracket (paid $9.99 on Amazon). 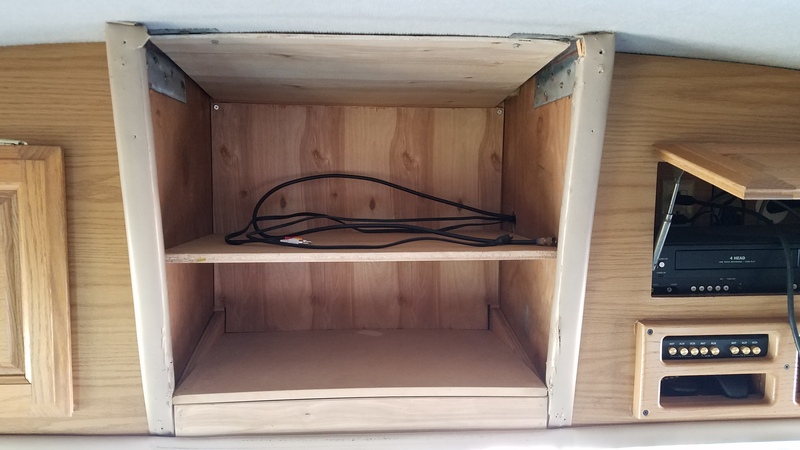 I was able to fit our odd size 29″ flat panel between the existing cabinet doors. We have an entertainment center for the master bedroom that could not fit a 32″ TV and our kids found a 29″ that they gave us for Christmas a few years back. 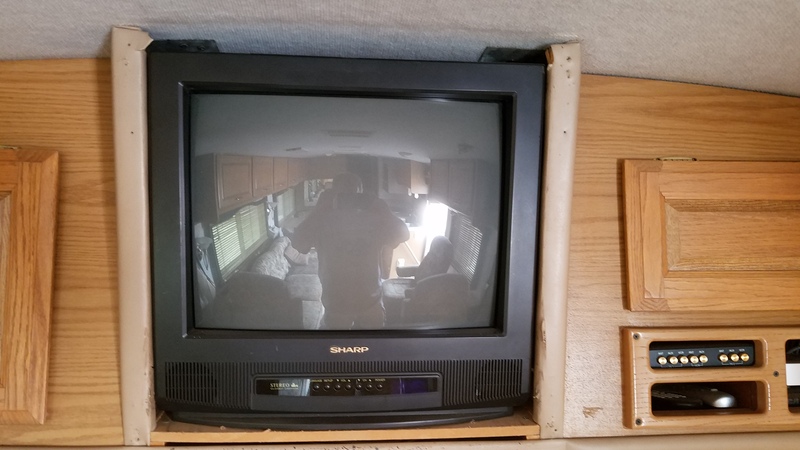 With much of the furniture in storage, I figured I could use the 29″ in the RV until we need it at home again and then I’ll probably put a 27″ in the RV if I can’t find another 29-30 inch screen later for the RV. Here’s the old dinosaur with the face plate removed, I was so anxious to get this replaced! 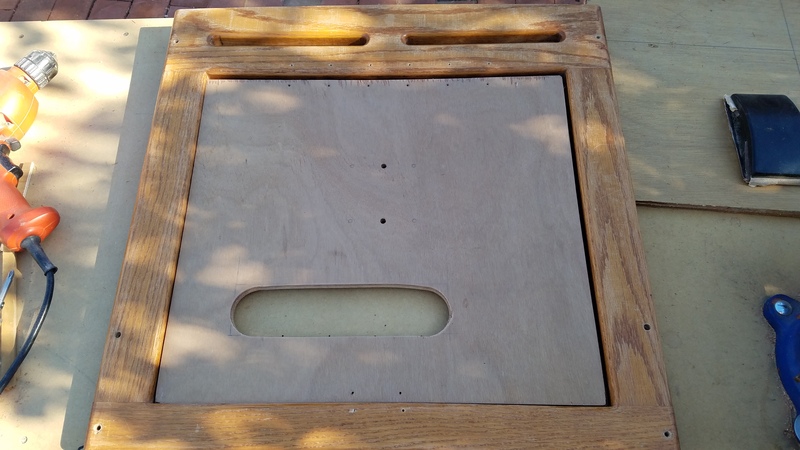 The bottom shelf is almost level after switching the inner braces, the outer braces that were level with the shelf before, are showing now but, that’s an imperfection I can live with. 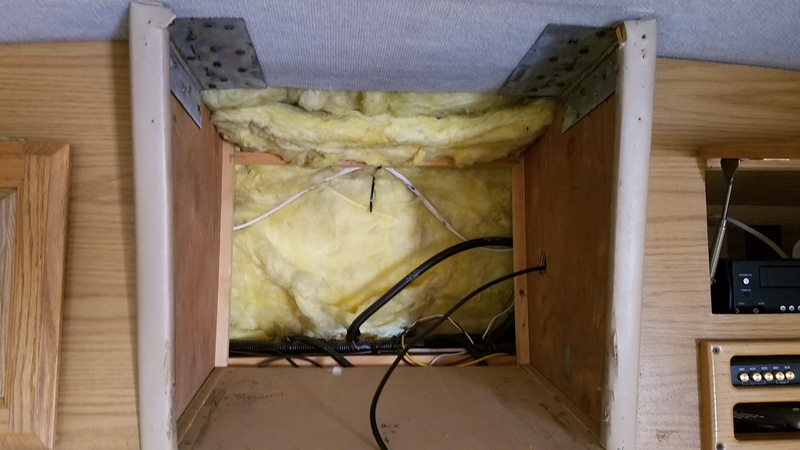 I added 1/4″ paneling on the top and back to hide the insulation and gaps in ceiling trim that were hidden by the old TV. 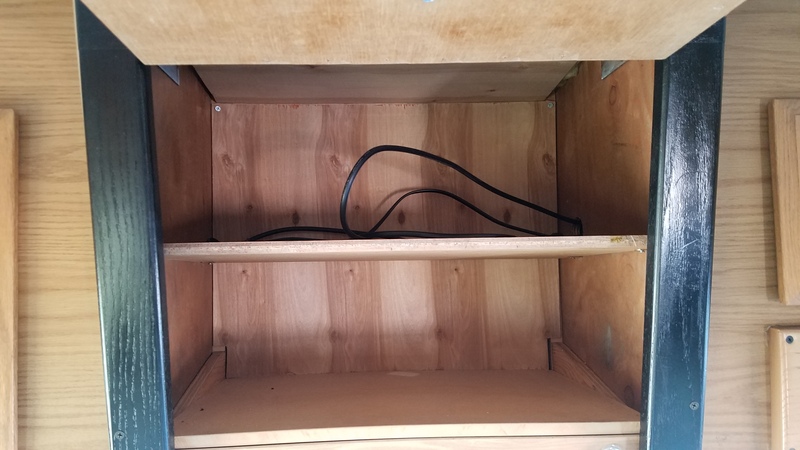 I added a middle shelf since storing tall items in here would be unruly in this space, no point in giving myself that opportunity! The face plate can’t hold the weight of a flat panel hanging on it since it only had six screws needed to keep the old TV from sliding out. Next step is adding some reinforcement for the hanging load. 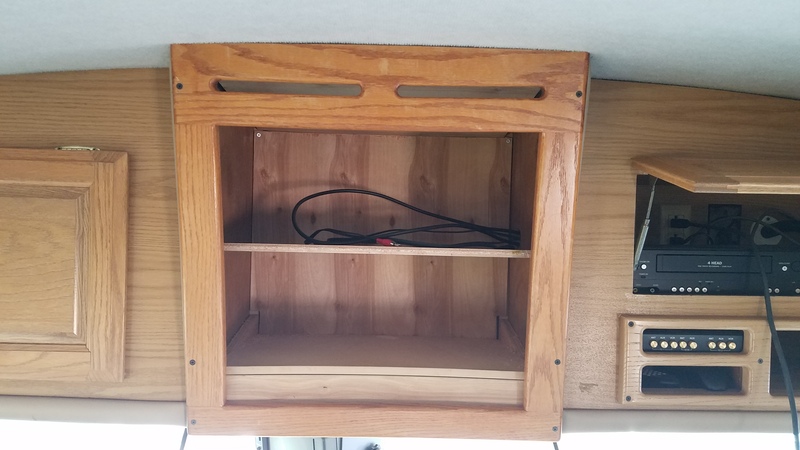 I added 2 metal brackets on the drivers side to anchor the face plate to the wall, the little 1″x2″ trim was not going to keep the flat panel and face plate from ripping out of the front. 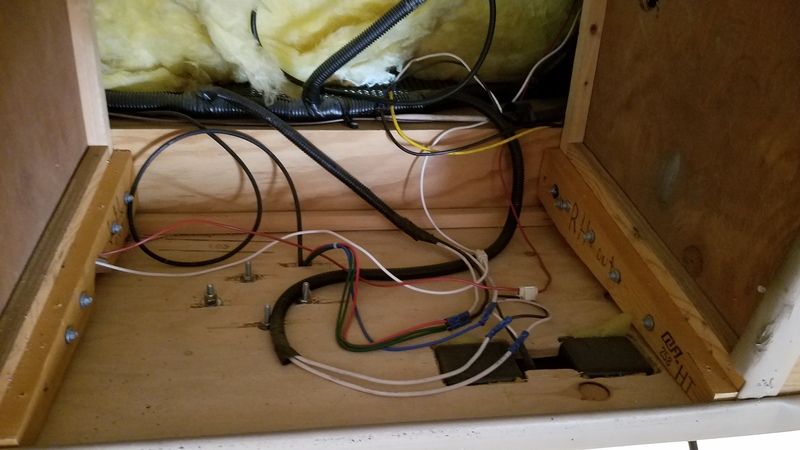 I had to add a long screw to anchor the faceplate. 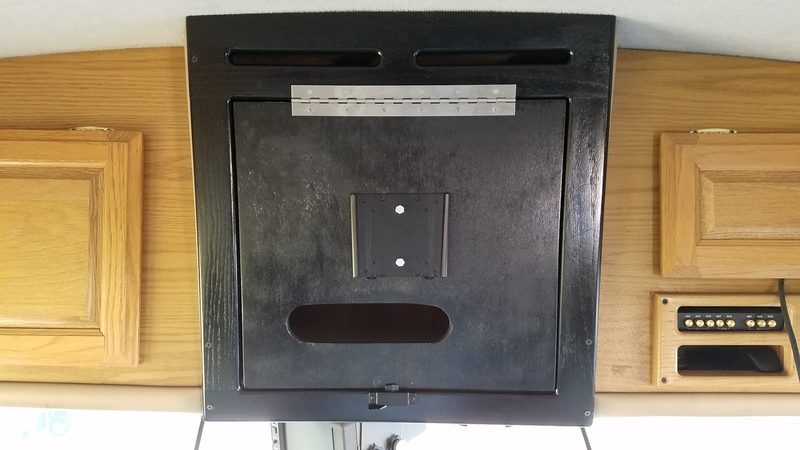 The black screw from the front of the faceplate ended up going into the bracket for extra support! 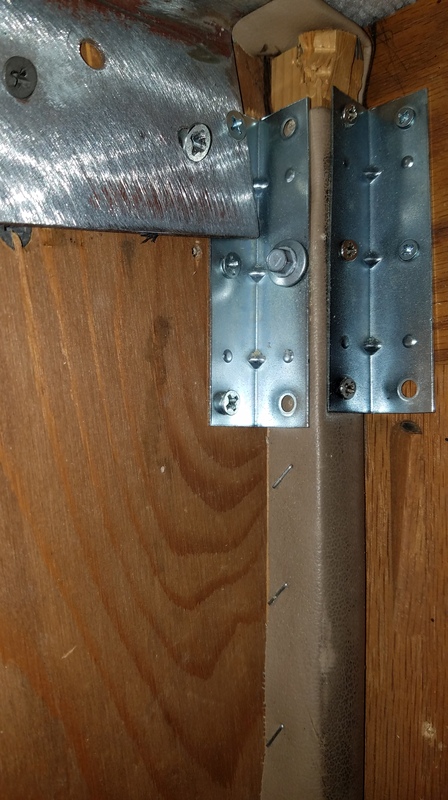 I added 2 more metal brackets on the passenger side to anchor the face plate to the wall. 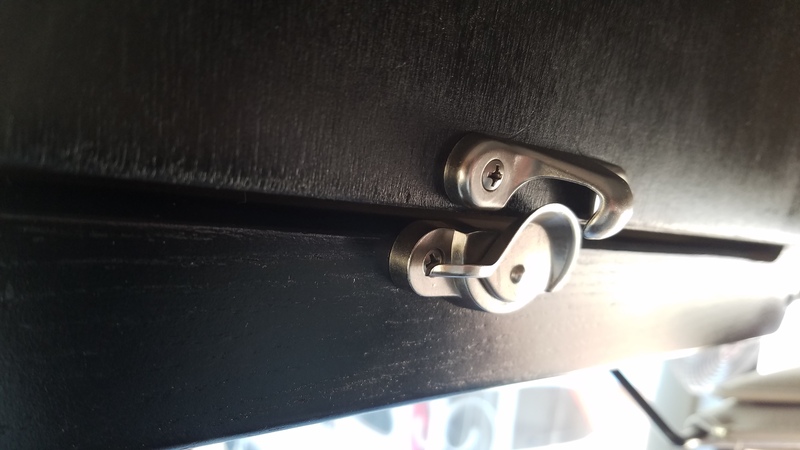 This side didn’t line up with the black screws from the front so the long one from the back will have to take the load. 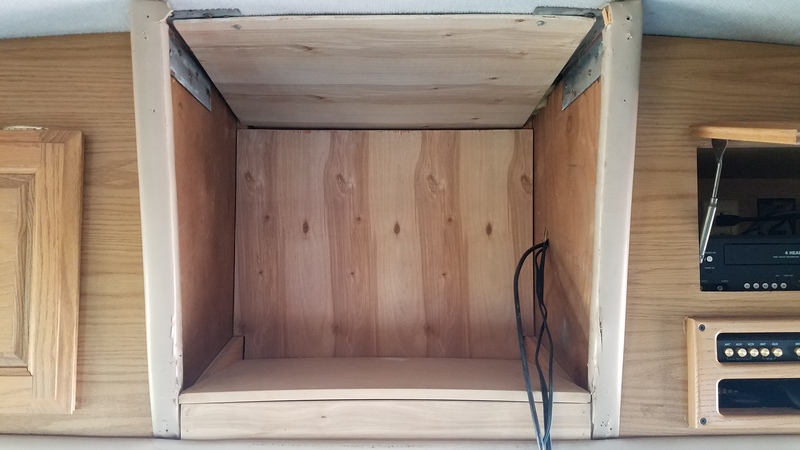 With the hinge and door mounted, I tested range of motion and access to the shelves. 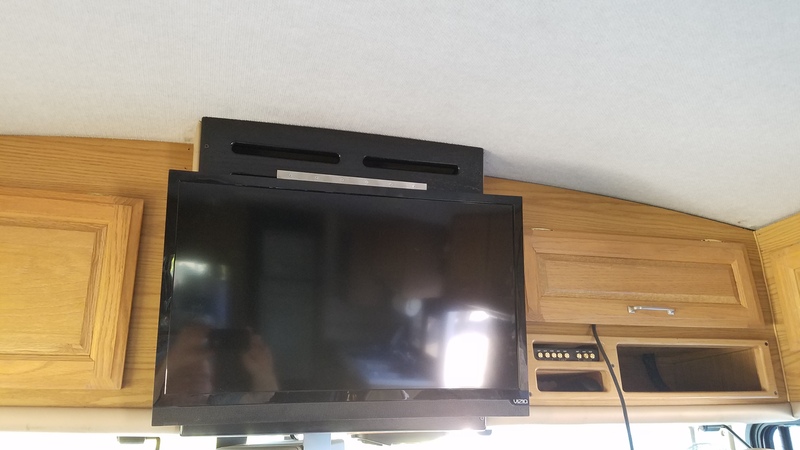 TV is mounted, tested the latch and range of motion, just wish I had a black hinge… Time to hook up the wires! I had doubts on reception but the new TV was incredibly clear! And just in time to catch the second half of the Sun Bowl but ASU never recovered… what a bummer!